Hala Baki is a PhD candidate and UCSB Doctoral Scholars fellow. She earned her M.A. in Theatre from California State University, Northridge and her B.A. 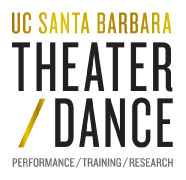 in Dramatic Arts and Global Studies at UC Santa Barbara. Her thesis research theorizes female Arab-American stand-up comedy as comic resistance, analyzing the potentially subversive social implications of performed female identity in that community and through that particular performance form. Her dissertation work explores the interaction of Arab American theater with social and political discourses, and it asks how the two mutually shape each other. She is interested in the intersections of the public sphere, social systems/institutions, and performance. She has presented her work at ATHE (2014 and 2017) as well as at the annual UCSB Theater and Dance Graduate Symposium, which she helped establish. Previously, she served three years as the production manager for Teenage Drama Workshop at CSU Northridge. She has recently served as Assistant Director for The Caucasian Chalk Circle (2017) and is currently co-director of MindReaders, a graduate student directing collective at UCSB.